I don't think I ever realized before how badly the PS2 generation of Tekken did. I know it was still huge in the arcade in Japan but I didn't think the difference was that stark. While the same genres may have released on home console and handhelds that doesn't mean they were treated the same, for example, I remember reading an interview about 3D Land and that entire style of 3D Mario was invented to be played in "bite size chunks" due to the portable nature of it, and I remember similar things being said for Luigis Mansion, Paper Mario, and ALBW as well. While yeah, we have seen full blown "console style" 3D Mario and Zelda games on DS and 3DS, they were all remakes, and even then they made changes to Majora's Mask to be better suited to portable play. I guess what I'm saying is, looking at the games they've announced they've pretty obviously abandoned the "bite sized chunks" style that they see as better for portable gaming, in favor of the traditional home console style games. Which leads me to believe they do see it as more of a Wii U successor. Most SM3DL levels are longer, denser and more challenging than prety much all of SM64. Is SM64 a handheld like experience that can be experienced in "small chunks" now? What about Super Mario World? Super Mario games have always been bite sized games ever since SMB3. Yoshi's Island and Super Mario Sunshine had some bigger levels, but the trend has been mainly towards small levels since SMB3. GR: How was designing a 3D stage for a portable Mario different than on a console? KH: Our first thought when designing the game was, and this might be a Japan-only consideration, is that you see a lot of people commuting in Japan to school or work. Usually they're only playing for as long as it takes to go through a couple train stations, so I decided that's how long I wanted it to take to clear a single stage. You certainly don't have restrictions like that on a console game. KH: Our first thought when designing the game was, and this might be a Japan-only consideration, is that you see a lot of people commuting in Japan to school or work. Usually theyre only playing for as long as it takes to go through a couple train stations, so I decided thats how long I wanted it to take to clear a single stage. You certainly dont have restrictions like that on a console game. Lenght of levels doesn't mean it was the portability that was a deciding factor but play sessions time. But even then, I can't think of any level since SMB3 that takes more than 5 minutes to clear. The new Senran Kagura has shipped 100k units, so says their twitter account. Was the game released in Asia? Japan was at 73k on last update, maybe it did super well on digital. yet the devs clearly believe that portability limits play session time, so they included the time limit and made the path from start to finish more direct, the quote "You certainly don't have restrictions like that on a console game" makes it clear some of the changes were directly due to it being on handheld. Mario Odyssey has none of the restrictions introduced in 3D land as far as we can tell. Not to mention that a number of games announced for the system are optimally played at home, Splatoon 2 where an internet connection is needed for the main chunk of the game, and Arms where not only is online needed but the controller setup they've been heavily pushing can't even be used portably except for tabletop mode, and then I imagine that'd be a bit awkward. I don't particularly care either way, but given that they've said they see it as a home console and their game lineup reflects that imo, for example, none of the games would make me go "huh that's weird" on a hypothetical non-portable Wii U 2, but I would be surprised by games like ARMS and Splatoon 2 on a hypothetical non-console mode 4DS, I'm inclined to believe them. The move was done at the height of the PSP/PS3 combo. With Vita sales in the gutter, PS4 failing spectacularly in Japan and their sales dwindling more and more, a business plan that only relies on the Sony home console market is becoming more foolish by the day. All of their Vita titles sold more than the PSP ones, they will have decline with PS4 only entries but with Ys VIII we already got the first signs that their audience is/will be moving. PC market is irrelevant in Japan also, and that's why they began to develop on Sony systems, not because of hardware sales. does minecraft counted as an old port? Compared to USF2 and Seiken Densetsu Collection? Did something like Elite Beat Agents come out on a console? Or Brain Age? Nintendogs? Miitopia? Brain Age and Nintendogs won't come out for Switch but not because they are handheld only experiences. What do you think will sell more either in Japan or Worldwide? ARMS or Pokken Tournament&#8203; DX? The review thread for ARMS was interesting since one of the complaints was lack of a story mode. ARMS has plenty of game modes which showed how it can appeal to the mainstream by having V-Ball/Hoops/Vs Hedlok/1v1/2v2 etc be playable in lobbies online while the ranked mode is separate for those that want serious competition. Learning new characters are easy as they have very similar move sets with only one unique ability assigned to them that the only other differentiator is deciding which weapons to use each round. Pokken Tournament for Wii U has a slightly lower metacritic score compared to ARMS which had similar complaints regarding barebones game modes and a mediocre story mode. Pokken Tournament for Wii U managed to sell one million units worldwide. Pokken Tournament DX has a few added characters and a new 3v3 battle mode. The mechanics in Pokken are simplistic but to use different characters, you have to spend time learning new combos and special moves to understand how to play them. Pokken has the advantage of brand power since it uses the Pokémon brand and is developed by Namco who have experience with fighting games. ARMS in comparison has no brand power to flaunt other than being a Nintendo IP and that it is made by the team behind Mario Kart 8 which is their first fighting game. Edit: Forgot, ARMS will have free content updates of more stages/weapons/characters while it's not known if Pokken Tournament DX will have DLC since the previous iteration didn't. I remember it being put in front of the PSN store for a pretty long time, unlike the previous game, so I'd guess it sold quite a bit digitally. Better legs than expected considering its reception. Pokken in Japan, Arms WW. I expect ARMS to outsell Pokken DX worldwide. ARMS is trying to do what Splatoon and before it Mario Kart did for their respective genre. Pokken is a good game but it's clear that its appeal is directly tied to the brand name itself. Bravo, you hit the nail on the head! (and EDarkness too). You could argue all you want about level lenghts on Mario 3D Land or the portability of Switch, but for Nintendo the things are pretty clear: Mario 3D Land is a portable game and Switch is a home console, so deal with it people! Actually Nintendogs would be a great title to bring back for the 3DS successor, with a stronger AR angle this time. Or no AR, but Kinect-like motion interaction with the pets, with two front facing IR cameras. My favorite idea for the next handheld would be 3DSwitch, with one detachable controller about the same size as the screen and a hinge between the rail and the screen, for clam shell functionality. Parallax 720p, small size. Switch between 2D and 3D, the animated logo and click sound would still fit because of the similar detachable controller. The two to three cameras needed will drive up prize, that's the one factor that makes relying on 3D for a cheaper Switch model for kids dubious. But it would be a distinguishing feature that could sell the smaller model to owners of the default Switch. Get rid of the IR sensor on the controller. Maybe smaller resolution, if games (and their fonts especially) scale downwards well enough. Compatible with regular Switch, except where hardware features differ (Switch has no camera). They're perfect mobile titles. I still could see a Nintendogs revival for Switch in combination with a mobile release. The only way I see Nintendo using 3D tech again is to do with VR. I don't see them making another 3D screen handheld when it didn't help as a selling point for the 3DS. At the January presentation, Nintendo made a big deal about the Switch containing the DNA of the previous systems, like Famicom dual controllers out of the box, Gameboy and GameCube portability, Wii motion controls. 3D is one of the features that is missing from Switch. I think that is because they wanted the 3DS to retain that as its defining feature. I don't think they will do dual screens again and the Switch is already a handheld. Keeping with 3D for the 3DS successor would clearly connect the two hardware lines, confirming its 3DS successor status. VR shuts out under 13 year olds, the 3DS has a 6 and above limit that doesn't really exclude, because you can turn the stereo 3D off. I think having a stereo 3D system will make it easier to have a line of games that can be played with or without VR, on a stereo 3D screen on the 3DS successor, or in VR on the Switch. They can push the same games for 3DSwitch and Switch VR, and everyone can play them, the way they prefer. Arms will outsell Pokken WW and I have a hard time not seeing the same for Japan. It has to underperform big time for all the push it is given from Nintendo. Nintendo are not going to be putting 3D in a console again. That feature's been nothing but a millstone around the platform's neck all generation. That's not true, there are a lot of people who enjoy the feature. There would be more if the 3DS had managed to provide comfortable stereo 3D with the first iteration. And as VR grows in popularity, so will regular stereo 3D. The 3DSwitch will be seen as a healthy (non isolating) alternative to VR. The Virtual Boy was also missing from the DNA of the Switch. Dual screen is also missing from the Switch, even though the DS is their best selling system ever. I think they will continue dual screen gaming with connectivity, using two devices together, like they started it on Gamecube + Gameboy Advance. Edit: Also, Kimishima confirmed that they do plan to support VR in the future and there's also a patent for an HMD add on that could be used with Switch. That would bring Virtual Boy DNA to the system. You mean dozens? While I'm sure some people enjoyed 3D I'm not really sure much people regarded it as a must have feature. Also I'm not that sure VR can correlate with on screen 3D interest, that would mean VR is going to make people interested in 3D movies again, which I'm quite sure it's not happening any time soon. Wii U was just one device (in terms of purchases), like the DS. It didn't contribute anything new to the Nintendo DNA, just brought it to home systems. Do you have any data supporting your claims? It sounds anecdotal. Most big blockbusters are filmed in stereo 3D and the 3D capable devices outsold the 2DS ones. There is interest for the technology, currently it is more successful than VR. Which has to do with the price, obviously. Even regular stereo 3D is held back by price. Edit: Many dedicated VR gamers say they cannot play flat games anymore, just like resolution snobs say they can't play in 240p anymore. Stereo 3D is a large part of the VR appeal and it shows in forum discussion. Sorry for the double post, should have edited. We know from the 3DS's first year that 3D screens weren't a good selling point. People didn't buy the system until Nintendo did a severe price cut a few months in that caused them to have their first financial loss in decades because even though the hardware sales went up due to the price cut, people weren't buying enough software to make up the difference. Compared to Switch, it has been selling out since launch and is selling at an even higher price than the 3DS. Add to this, we've never heard people lament the lack of a 3D screen on the device. That's not true, there are a lot of people who enjoy the feature. I'd be very interested if someone could point me to the last time Nintendo made a big deal about 3D on the 3DS. Seems to me that they tried to jumpstart interest in with with the New 3DS, and have barely mentioned it at all since. also, is 3d still popular nowadays? That's what I wonder. It was only ever good in Avatar as a 3D movie and that's it. Actually the launch was strong and the continued increased sales could also be due to the games announced and released starting in fall. We'll never know how well the 3DS would have sold at its old price, maybe it was just the barren release schedule. 3D alone didn't prove to be a system selling feature but it didn't prove to be a millstone around its neck either. Again, the stereo enabled versions tend to sell better (even after the 2D only ones were released, I think). I did actually. Minority of course, but one person already trumps the claim of never. Also, the Switch is still behind the 3DS. It did sell well at launch, Switch still has to catch up. 3D definitely wasn't a millstone. It's part of the name. You cannot mention the 3DS without mentioning its defining hardware feature. Well, yeah- they're the flagship versions, plastered all over every advert, and in a more universally-appealing form factor. You can't say that's just down to the 3D element, particularly considering that it's been years since Nintendo gave that feature any sort of prominence. If the 3D was a compelling, universally-appealing feature, the 2DS wouldn't exist at all. In my country, there were widespread reports just before the 3DS launched that the 3D technology in the system would hurt the eyes of small children. The system NEVER recovered from that. That was a decision made seven years ago- you can't honestly argue that it means that they're still pushing that feature today. Look at any advertisement or game announcement for most of the system's life, and at the very best the 3D is a footnote, even if it's mentioned at all. The biggest selling games in the system barely even use it at all. Things like this also affect VR though. Compared to that stereo 3D that can be turned off will be seen as healthy. Kids will clamor for VR at some point, parents will buy 3DSwitch instead. Nintendo has a habit of returning to things they tried before even if they didn't succeed (sandbox Mario) or even when they get burned (Virtual Boy didn't stop 3DS from happening and that one became the third best selling system ever in Japan). Actually the launch was strong and the continued increased sales could also be due to the games announced and released starting in fall. I beg to differ. The launch had large shipments, but the system wasn't selling well when the following quarter only shipped 700k more 3DS units worldwide. Following the system's price cut of almost one third of its original price, sales saw an increase of more than 260 percent during the comparable 19-day time period in July. About 185,000 units were sold following a price cut on August 12. Nintendo sold more than 235,000 Nintendo 3DS systems in the United States in August, being the second best-selling dedicated game system for the month. We'll never no how well the 3DS would have sold at its old price, maybe it was just the barren release schedule. I can guarantee it would have sold a lot less. 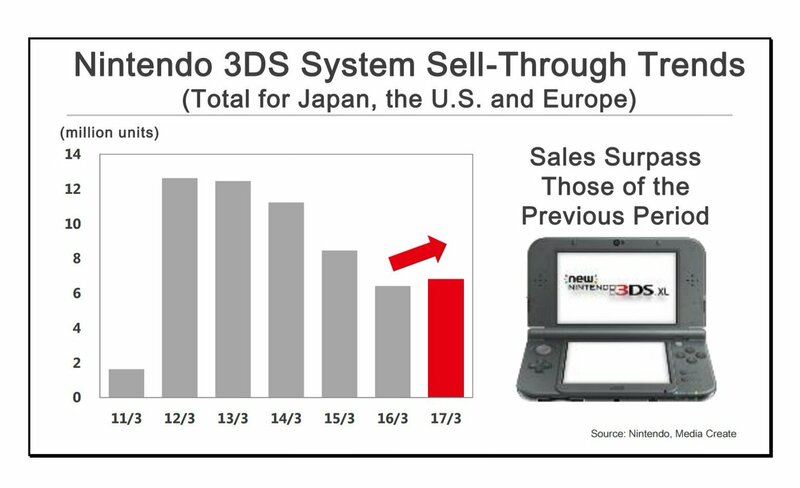 Look at this distribution, the 3DS peaked in sales at FY3/2012 which coincides with the severe price cut. That is not normal for a product life cycle, a normal product life cycle would have shown growth for at least two or three years at most and then decline. The 3DS declined in sales so quickly for its yearly performance. Switch does have dual screen with their online voice chat app. Checkmate atheists. Still kinda shocked how well Nier: Automata has done. By the standards of PS4 software sales in Japan generally, its done crazy good for a mid-budget title. It also coincides with the releases of Mario 3D Land, Mario Kart 7 and MH3G. All of which were announced shortly after the price cut. The price cut and improved line up cannot be separated. That's the direction I see them going. Now they just need to provide a grip to hold the smartphone and show Splatoon's map for quick jumps in the app. But you're claiming it would have sold just as well without the price cut. That's not likely, I just showed you why with actual data. It's gospel around here that price cuts only boost sales for a short time and that games really sell systems. Splatoon 2 and Switch are demonstrating this quite clearly currently. They already patented a Joycon grip with phone holder I believe. You're doing a swell job refuting my points with anecdotes and fluff. How are Switch sales numbers and Splatoon 2's preorder performance (as well as expected sales) anecdotal? I'm not talking that, I am pointing out how you bring up a straw man since you can't refute my point about why 3DS sales wouldn't have done as well without the price cut. The thing is, both the price cut and the trinity happened in the same quarter. Note that an announcement can already increase sales. There is really no way to tell which was more important, they both happened at the same time.